Two months later that cell exploded. More information and pictures here. I managed to kill a trustfire battery, I left it charging in the 9x on 12.5V for a few days. I think that 12V is just too much heat for the protection circuitry to dissipate. Good thing is the batteries worked as promised and did not catch fire, although they are not completely idiot proof. I will look into it some more but for now only charge at 9v. Why? Bruce explains it pretty well. To summarise. Safer, no risk of fire like lipos. well, less risk. More efficient, the 5v regulator inside does not need 11.2V and is happy with just 6.5V. Less heat, more battery life and more regulator life.. Although it is more work, my implementation differs from Bruces such that. You can use the new battery pack on standard chargers and for other things. 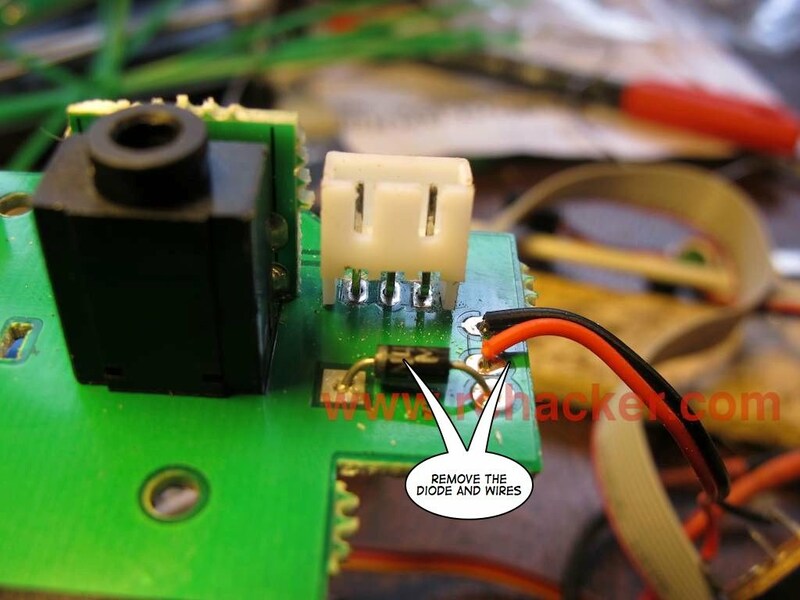 Reverse voltage protection for the 9x from the battery and external power. You can leave the batteries in the radio and charge with 9v in the side of the unit. With a slot cut in the battery cover the XT-60 connector can be exposed to power your Fatsharks or FPV gear. For those interested there are some pretty good Trustfire testing and specs here. I used 2400MaH Trustfires that I bought on E-bay, search for 'trustfire 18650'. Step one. Preparing the batteries. Here they are compared to a typical AA battery, big fellas. The goal is to make this into a standard battery pack so it can be used with any charger or for something else. Here I have a three lead jst-XH plug and an XT60 plug. I only had a spare 3 cell balance lead so I cut the plug of the original pack. Popped out the leads with my favourite dental tool. They should come out with very little force needed. Close up, you might just be able to see the tab that needs pushing down to release the wire. Some re-arranging and we have our new plug in the same format as any 2 cell balance lead. First tape them together with opposing polarity. Now for some soldering, I use a 140W gun iron for the heavy wire and battery work, and this 24v goot for all my fine work. Plenty of temp for a short time along with lots of flux is the trick to get the solder to stick the the battery terminals. 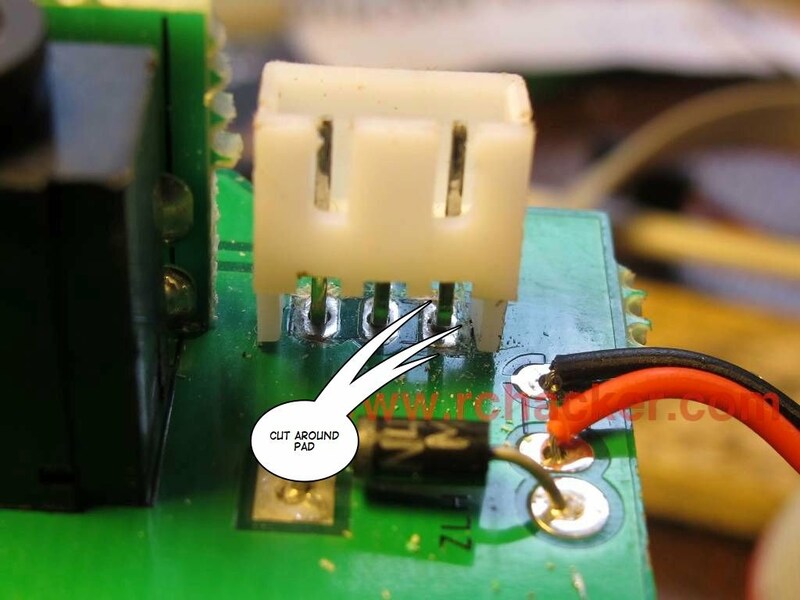 This short piece of 16AWG wire will connect the + and - of this end. The smaller grey wire will be the 3.7V line. (till then the grey can connect to either end of the short red wire). Preparing the jst wires, if you like that is all you need. 16AWG is overkill even for the max 5A rating for the batteries but its what I had laying around and it fits the XT60 plugs nicely. 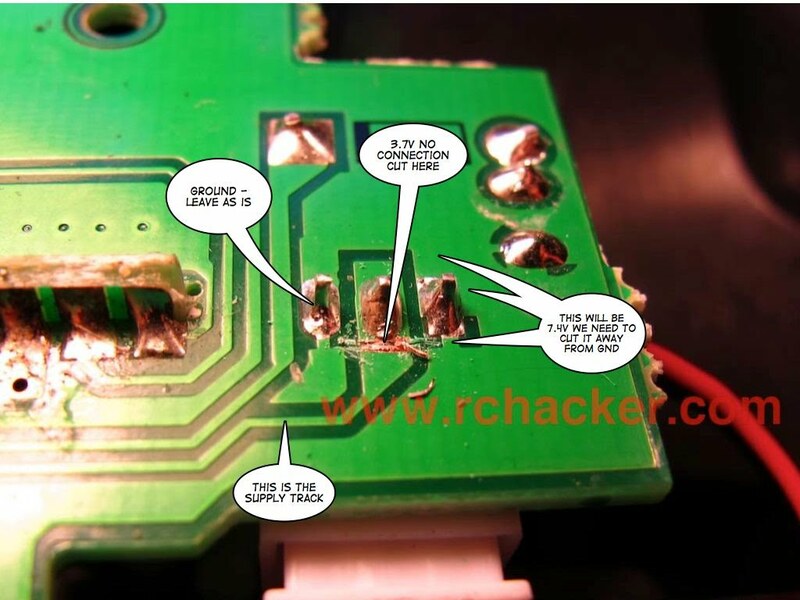 Not too much heat or you will damage the protection circuitry that is in the end of the battery. If you are a gumby practice on some old D cells first. Heat helps to hold the two wires together while soldering or you can wrap the end with a strand of bare wire. Check and double check this is the right way round. A bit more tape to protect the ends. And our battery pack is done. Next we need to mod our radio other wise it will blow up with this battery. Step 2: Modding the 9x. This time we are only going to work with the board on the back of the unit. Remove the screws so we can access the other side of the board. The 12V input plug can then be pulled so we can lift the board up to get to the other side. 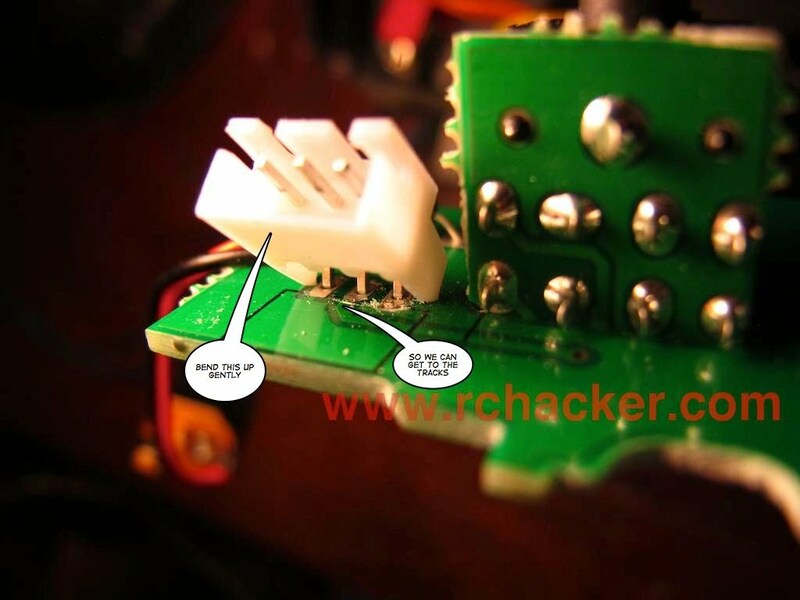 The pots and switches will still be attached, be careful. Here is out battery socket, Bend it up gently so we can get to the tracks underneath. Left pin will stay as ground so you can leave it as is, we want to isolate the middle and right pins. There are three short tracks connecting the pad to ground, cut em. 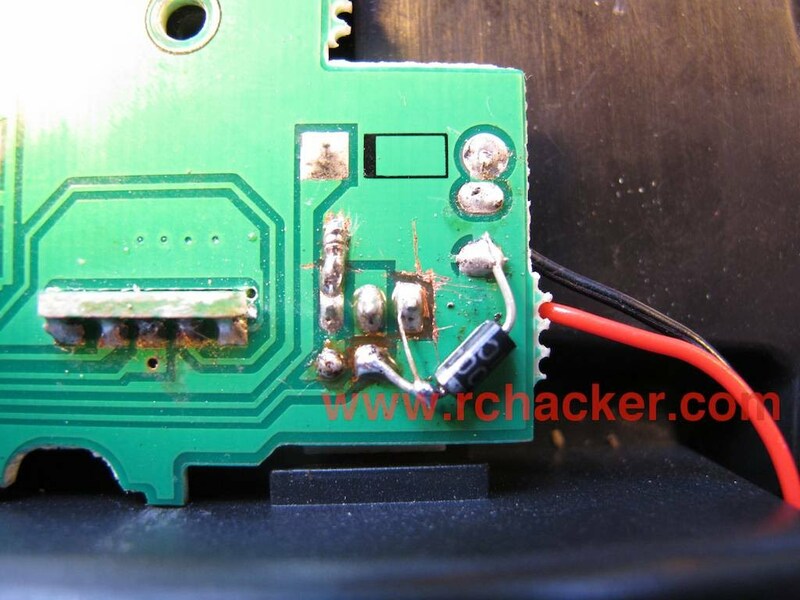 Using the soldering iron on the other side, remove the diode and external power wires. We are going to change it so we can charge the batteries directly and have reverse polarity protection for both the batteries and external power. I bent it back down no problems however it will not be as straight as it was. Back to the other side. I first use a very sharp knife to cut the tracks and and then something blunter to clear the copper away. Ground is on the left, and 7.4V on the right. 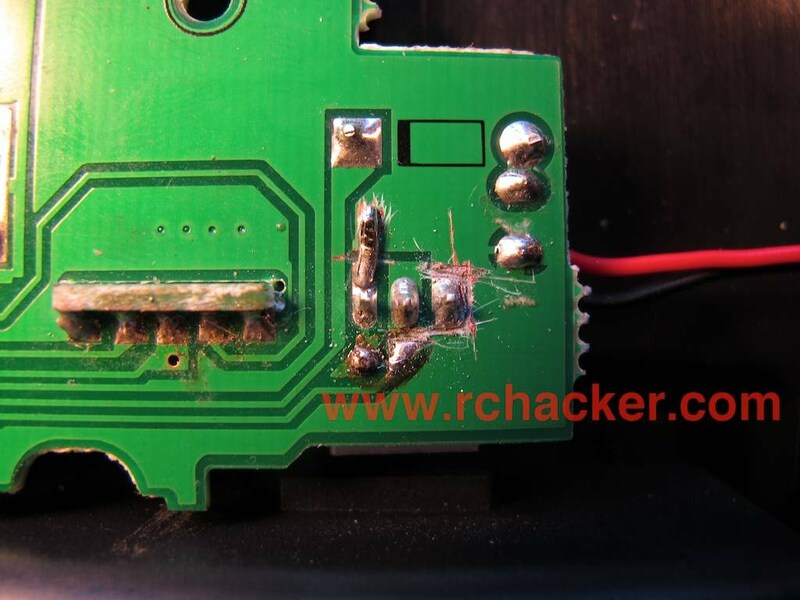 The center pin will not be connected but will be 3.7V. Again a sharp knife but this time just scratch the green away to reveal the copper underneath. I made a mistake here, we only need to make a pad below the center pin. Track modifications for this side finished. Center pin isolated and a pad made below it. The right pin is also isolated. 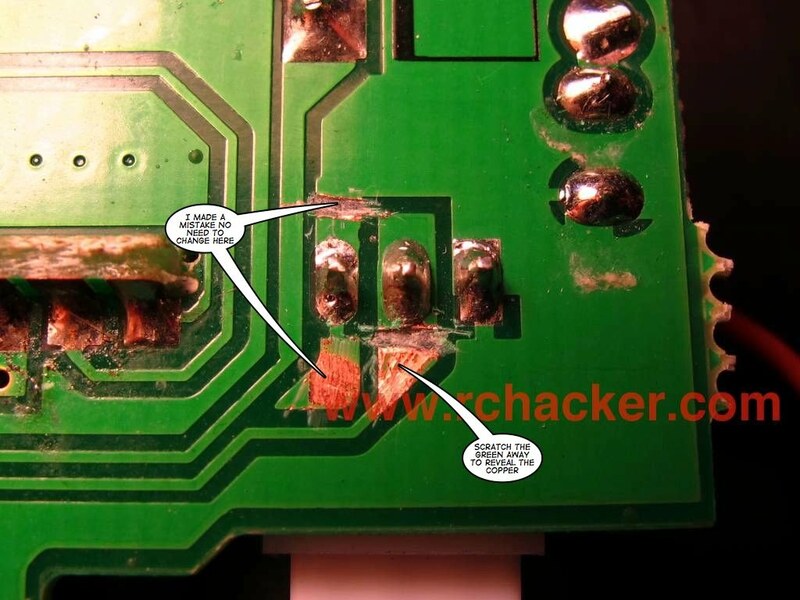 Left pin you can leave as is, here I have fixed my mistaken hacking. Solder the diode from the other side in place as shown. The very thin wire is our fuze, I used the core from some kynar wire, but any strand of copper will do. If we connect a battery or power supply to this the wrong way the small wire should burn out. Re-locate our leads for the power supply jack and we are done. We can now connect any 2 cell battery via its balance lead to run the radio. With the Trustfires inside and their clever protection circuits we can stick 9 or 12v into the side of the unit and safely charge without any special charging equipment. We can even charge the unit while using it. They are a perfect fit also. If you cut a notch in the battery cover the The XT60 connector could be used to power other equipment such as Fat Sharks. Damn its beeping at me. Don't worry, last step is to go to the open9x setup and calibrate the battery sensing circuit. 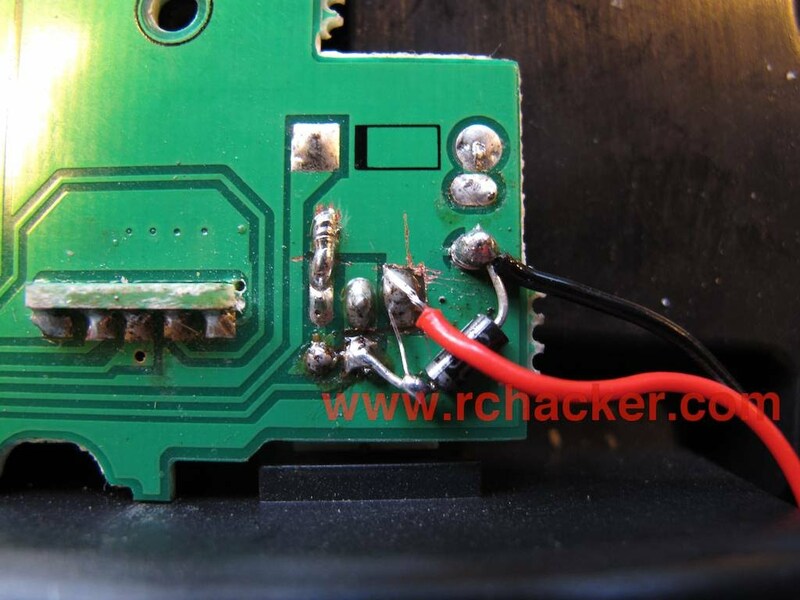 Measure the voltage on the battery with a multimeter and adjust the voltage on the 9x match. After looking at the tests I set the low voltage alarm at 6.8V, although 7V might be a safer bet.